A native of Owensboro, Kentucky, Brent became Master Distiller at Four Roses Bourbon in September 2015 and he is uniquely qualified for this role… after all, he’s been involved in Producing Four Roses premium Bourbons since he began with the company in 2005. 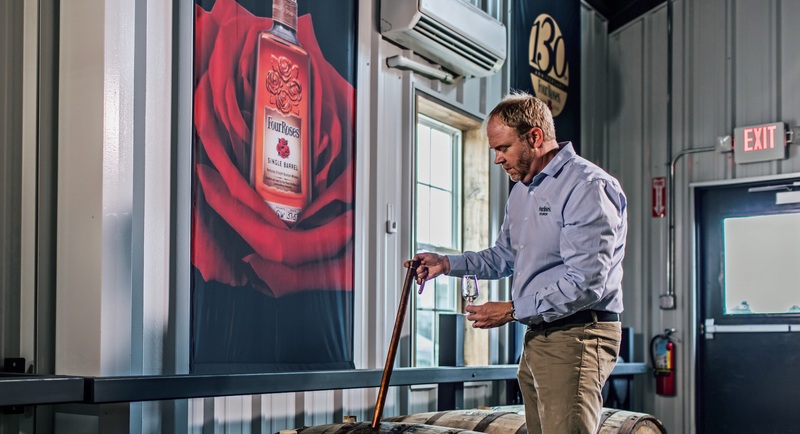 As the Distillery’s Director of Quality, Brent’s year of experience with Four Roses include everything from applying his Chemistry degree in production, managing barrel inventories, production planning, to selecting barrels for special Single Barrel bottlings and Limited Edition products. Brent applies his on-the-job experience to his role of Master Distiller, ensuring that each Four Roses product has the fruity, smooth and mellow character, along with a hint of spice, that the brand has become known for around the world. Every stage of the production process is critical and you’ll find Brent’s heart and soul in every one of them. Brent is eager to chat with Bourbon fans far and wide, so pour a sip or two of your favorite Bourbon, mellow out a little and check our Events calendar to see when he will be in a city near you. What is your responsibility as Master Distiller? My focus will always be what got me to where I am, and what got the Four Roses brand where it is today, and that’s quality. It will be a challenge to be as involved in Quality as I always have been and to promote a brand that I love, but it’s a challenge I welcome!If we maintain the same quality that has come to define Four Roses and I successfully share my experiences and passion with the growing number of Bourbon enthusiasts, then I will be doing my job. This brand speaks for itself, and I’m committed to maintaining the product and sharing Four Roses Bourbon with as many people as possible. More Bourbon of the same quality they know and love. And, with our recent investments to increase our capacity, even more people will have the chance to enjoy Four Roses. What gives you the most satisfaction at Four Roses? I love music. Picking a favorite band or genre is similar to the question about my favorite recipe. There is a whole world of rich, wonderful music out there. There are a million tangible and intangible factors that at any particular time make a certain sound “perfect”.